Emoji pictionary is a modern and new game and it is very popular these days. This game is a popular choice for Baby Shower parties. I have also made children's books Emoji pictionary and nursery rhymes Emoji pictionary games. I have made all these games in three different colors. You can print these in the color of your choice by using a color printer at your home or you can also get these printed from the market according to the number of your Baby Shower party's guests. 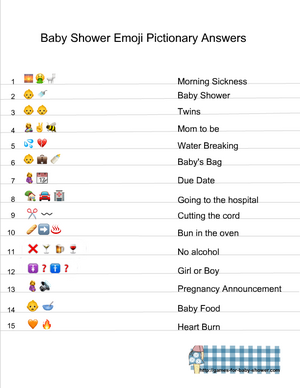 How to Play: Distribute the Baby Shower Emoji Pictionary Cards among the guests along with a pen or pencil. 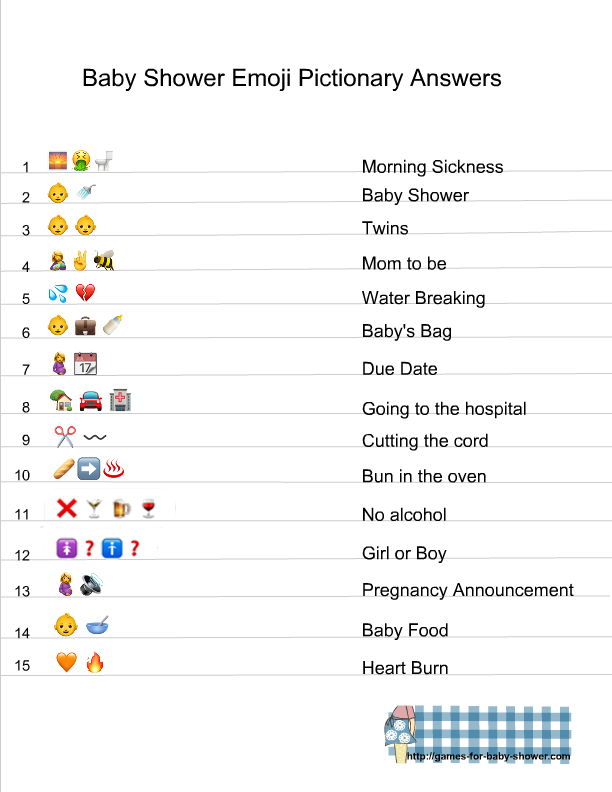 Ask the guests to guess all the baby and pregnancy related words and phrases with the help of the clues provided in the form of Emoji. You can check the answers given by the guests using the answer key given at the bottom of this page. The guest with most correct answers will be the winner. 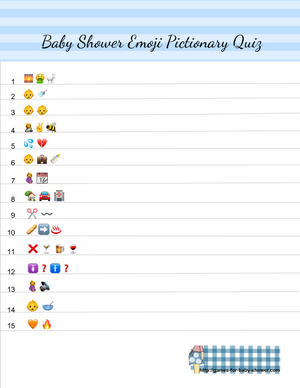 This is the first free printable of this unique and modern Baby Shower Emoji pictionary game. This game printable has a light pink striped header. There are 15 clues given on this game card. The guests will have to guess all the words and phrases mentioned through those close. In order to save this game, just click on the thumbnail and a bigger image will open up. You can right click and save that bigger PNG image. This is the second free printable that I have prepared for this Emoji pictionary game. It has a blue striped header. Just click on this thumbnail image and a bigger image will open up. You can right click and save that image. This game is perfect for a boy Baby Shower. This is another unique and gender neutral color for this fun and modern baby shower game. I am sure that your guests will love to play this game. Just click on the thumbnail image and then right click and save the bigger printable one. 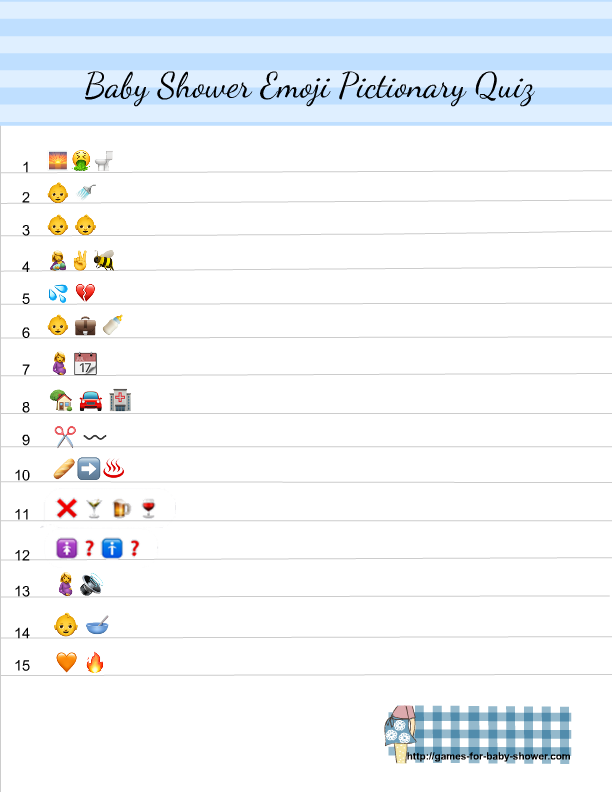 Here is the answer key to this free printable Baby Shower Emoji Pictionary Quiz. You will be needing just one copy of these answers. Click on thumbnail image and a bigger image will open up, you can right click and save that.